Mr Robin Selvanayagam. (That is him in the picture along with me and my sister). 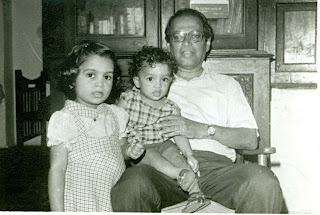 I remember the days when I used to sit in the drawing room asking him all sorts of questions ranging from World news to sports to Indian History to movies to music to Worldly wisdom. He had answers to all my questions.He was a man of few words. ( A trait that my dad aquired from him and failed to pass it on to me). The first cricket bat I used was the same bat that he used when he played cricket as a teenager. It was a heavy bat (even heavier than Sachin's bat). When I started using it, the bat was taller than me. Even now it does not make much of a difference. My thatha was a cricketer in his teen-days. He used to teach me the basics of the game.I always had an eye for his steel HMT watch. He was my dad's dad and I called him thatha. Thatha had a Bush TV; a similar version to the one that we had at our home. The only difference was that His TV had around 100 channels and the TV at our home just had one channel ,"Doordarshan". So when ever I wanted to watch my favorite shows on TV, I used to run to his place. WWF was a puller then. I used to watch with awe and amazement at the skills of the wresling stars.British Bull dog, Razor ramon, Sid justice were a few of my favorites then. Watching Santa Barbara and Bold and beautiful were considered to be vices for a 8 year old guy like me. Thatha never allowed me to watch them and my curiosity on the show grew and reached greater heights. The first series that thatha allowed me to watch was "The wonder years". I liked it. It was thatha's favorite too. We both watched discovery channel for hours at a stretch and he knew about almost every living creature on earth. Such was his knowledge about things around him. His music taste was weird. He had a big gramophone and every evening he played his favorite musical pieces. Symphonies of beethoven and mozart always filled the house. He had a great collection of reader's digest. He had each and every single edition of readers digest right from the mid sixties. He went into HIS abode in 2000. He was a great man.He spoke very less to others.For me, he was my human encyclopedia.I have never seen a man with such knowledge like him. i spcly liked d warnin thr!! You are so lucky! I hardly knew my grandparents. Just some tapes with their voices. I wish i was born earlier! and WWF was my fav too. Have been planning to go see a live event soon. my fav was stone cold steve austin and undertaker..
yea! stone cold,rock and UT are my fav now..brock lesner too.. these guys are steroid dungeons.. He is a engineer and he taught me good mathematics and physics in my tenth std.